The world’s largest photovoltaic (PV) solar power project has stumbled over an ecological roadblock. 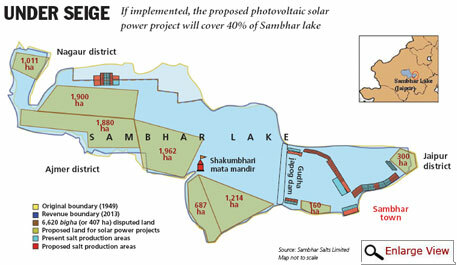 The Centre plans to set up 4,000 MW ultra mega solar power project (UMSPP) in Sambhar Salt Lake at Rajasthan. Last year the project received in-principle approval of the state government, then led by Ashok Gehlot who belongs to the ruling Congress party at the Centre. But in January, the newly-elected chief minister Vasundhara Raje wrote to the Union Minister of Heavy Industries Praful Patel expressing her reservations about the project on the largest inland saline wetland in Asia. Instead of an industrial project, she said, she would like to develop the wetland as a tourism site. But on January 29, four days after Raje sent her letter to Patel, three Union ministries, including his, and six public sector undertakings signed an MoU to develop and operate the project, which is expected to generate 6,000 million units of electricity annually for 25 years, and offset over four million tonnes of CO2 a year. It also aims to reduce the cost of solar energy from Rs 7-8 to Rs 5 a unit (see ‘Ambitious solar plan’). The concerns of the state government have, however, alerted the World Bank. The Centre had approached the Bank for loan of US $500 million for the first phase of the Rs 30,000 crore UMSPP. “We can commit the amount only after the issues are cleared,” a World Bank official told Down To Earth (DTE). Raje’s concerns stem from the fact that the project requires PV solar panels installed across over 9,000 hectares (ha). This will cover about 40 per cent of the lake that spans 24,000 ha. It attracts over 70 species of migrant birds and is the second largest breeding ground of flamingoes in India after Rann of Katchch. Because of such ecological importance, the section four of the Wetlands (Conservation and Management) Rules 2010 prohibits setting up new industries and expansion of the existing ones on wetlands. Though a sub-rule under the section allows the Centre to permit any of the prohibited activities on the recommendation of the Central Wetlands Conservation Authority (CWCA), the authority is yet to receive project proposal. “We can comment only after we see the proposal,” Brijesh Sikka, member of CWCA, told DTE. 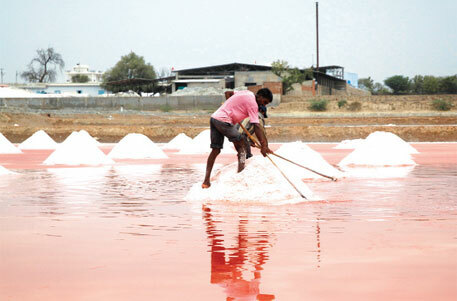 R K Tondon, managing director of Sambhar Salts Limited (SSL), a PSU that owns the lake and its catchment area on a 99-year-lease, beginning 1961, for salt production from the state government, claims that the land given for the project has been lying barren for several years. Salt extraction happens only on 2,400 ha. “A green project is the best way to utilise the surplus land without harming the wetland. Besides, the lake boundary is yet to be notified,” he says. Last year, the state revenue department identified the lake boundary, but a notification in this regard is pending. While Tondon’s view is debatable, Raje in her letter points out that the land was leased for mining salt, and in case of any change in land use “an approval has to be sought from the Rajasthan government”. Besides, any industrial unit, including solar project, must apply to the state environment department for consent to establish and operate, she wrote. The Centre is yet to submit the project proposal to the department. “We are aware of the concerns raised by the Rajasthan government. At the moment we are lying low and waiting for the results of the Lok Sabha elections,” says an MNRE official, adding, “It is a good site and we will try to negotiate with the state government.” According to Solar Energy Corporation of India, a PSU implementing the project, the site has a plain surface with basic infrastructural facilities. A motorable road links the site with the National Highway-8, just 40-45 km away. Power substations that are required to transmit and distribute electricity are located nearby. “We do not want to harm the wetland. We are setting up the project after inspecting that the site is lying barren. However, we are open to the option of setting it up in some other site,” he adds. Sources in the Rajasthan government say the state is looking for an alternate site for the UMSPP because it does not want to let go of the important project. But it is determined not to allow the UMSPP in the wetland. In 1990, the Sambhar Salt Lake was declared a protected site under the Ramsar Convention, a global treaty on wetlands of international importance. But over the period, the lake is dying a slow death. Four seasonal rivers—the Mendha, Rupangarh, Kharian and the Khandel—which used to feed the lake have hardly contributed to it in the past five to six years. Residents of nearby villages build checkdams along the rivers and divert the water for agricultural use and other purposes. Now, the lake is mostly dependent on rainwater. Rampant illegal salt production and groundwater extraction have dried up the lake, according to a 2008 study by Sanjeev Kumar, a scientist at Jodhpur’s Desert Regional Station of Zoological Survey of India. This has threatened the lake’s rich ecology. “In 1982-83, more than 500,000 flamingoes visited the lake. Their number reduced to 20,000 in 2008. Now there may be just a few hundreds,” says Naresh Kadyan, chairperson of Haryana-based non-profit People For Animals. Last year, Kadyan filed a public interest petition in the Supreme Court, urging the Centre and the state government to take measures to save the lake. In his petition, Kadyan has accused unauthorised salt manufactures of digging borewells in the lakebed and laying pipelines, which sometimes extend several kilometres across the lake, to extract brine. The practice is rampant along the lake bordering Naguar and Ajmer districts, states the petition. A fact-finding committee of the state government, headed by bureaucrat Vinod Kapur, stated in its 2010 report that about 240 borewells were operating in the lakebed. Excess water extraction has lowered groundwater levels by almost 60 metres in the area. Deprived of recharge from subsurface flows, the lake is shrinking, said the report. In response to Kadyan’s petition, the state government in February 2014 informed the court that 60 per cent of the lake remains dry for more than eight months and that the area under water varies depending upon the intensity of rainfall every year. “During peak monsoon season, only 13,000 ha gets inundated,” Tondon adds. In 2013, Gehlot passed an ordinance to establish the Rajasthan lake development authority for conserving and restoring lakes in the desert state. But it is yet to see the light of day. Raje reportedly is relooking at the ordinance to strengthen it and is discussing the matter with the law department. “The National Environmental Engineering Research Institute in Nagpur has prepared a management plan for restoration and conservation of Sambhar lake. It will be implemented by next year,” says Y K Dak, secretary of the state environment department. Can solar plant coexist with wetland? Plans to set up industrial projects on wetlands and oppositions to them are not new. In the late 1980s, portion of Chilika Lake in Odisha allotted to the Tatas for commercial shrimp farming was taken back following protests and consideration of its environmental impact. More recently, clearance to a cement plant of Nirma Industries in a wetland of Gujarat was cancelled following a review by the Union Ministry of Environment and Forests. But this is for the first time that a solar power project has been proposed on wetland. While the project proponents believe it can coexist with wetland, experts are divided over it. T V Ramachandra, faculty at Energy and Wetlands Research Group in the Indian Institute of Sciences, Bengaluru, says a solar project can be set up on a wetland as long as it is in the catchment and maintains the 200 metres buffer from inundation site. “This way water can flow beneath the panels and a grass cover can be grown underneath to aid percolation of water.” Ramachandra, however, could not provide an example of a wetland that harbours a solar project in other parts of the world. Ritesh Kumar, director of South Asia unit of Wetlands International, says wetlands should remain inviolate because of high ecological value. They support large biological diversity and provide a wide range of ecosystem services including groundwater recharge, erosion control and flood mitigation. Critising SSL’s argument for allowing the solar project in Sambhar, he says, “Just because a part of the wetland has not been inundated for quite some time does not mean it is barren.” There are instances of changes in inundation patterns that might be attributed to alteration or fragmentation of hydrological regimes within the basin. Efforts need to be made to restore the ecological conditions rather than promoting alternate uses that are bound to change the character of a wetland, he adds. Sanjeev Kumar says an UMSPP would be detrimental to the lake’s ecology and flamingoes. “They are tall birds and land in flocks. They need vast unhindered areas for movement and feeding which Sambhar lake provides.” He disputes project proponents’ view that flamingoes are found only between Gudha Japog dam and Shakumbari Mata temple (see map). They move all across the lake as wind takes algal blooms to the edge of shallow waters, he adds. Dhrubajyoti Ghosh, a wetland ecologist based in Kolkata, says catchment of a waterbody is meant to catch water, which should not be compromised. Besides, the lake was allowed to dry up. Now, instead of restoring the lake, the government is using its barren state as fait accompli to set up the project. The debate over coexistence of solar power project with wetland is futile as the project is a clear violation of wetland rules, says Brij Gopal, coordinator of Centre for Inland Waters in South Asia. The 4,000 MW ultra mega solar power project (UMSPP) planned at Sambhar lake of Rajasthan is the first of the four such projects conceived in 2013 by the Ministry of New and Renewable Energy, Ministry of Heavy Industries and Public Enterprises, and the Ministry of Power. It would be set up and executed by six Central public sector units (CPSUs). The other three projects would come up at Khargoda in Gujarat and at Ladakh and Kargil in Jammu and Kashmir. Responsibilities among CPSUs have been divided, as is the equity share. Bharat Heavy Electricals Ltd will supply equipment; Solar Energy Corporation of India will sell electricity; Rajasthan Electronics and Instruments Ltd will look into operation and maintenance; Power Grid Corporation of India will look into power evacuation; Satluj Jal Vidyut Nigam will be in charge of managing the project, and Sambhar Salt Ltd which is a joint venture company between the Centre’s Hindustan Salts Limited and the Rajasthan government will provide land. It will be set up in phases. The first phase aims at achieving 1,000 MW by the end of 2016. Big solar projects are great, but why use up our precious green space when there are so many empty rooftops just waiting to be fitted with solar panels? We need to focus on getting every home, business, and public building to go solar. Anyone can afford it, and you will end up saving a TON of money. DESERTEC is a project supported by a foundation of the same name and the consortium Dii (Desertec industrial initiative) created in Germany as a limited liability company (GmbH). The project aims at creating a global renewable energy plan based on the concept of harnessing sustainable power from sites where renewable sources of energy are more abundant and transferring it through high-voltage direct current transmission to consumption centers. All kinds of renewable energy sources are envisioned, but the sun-rich deserts of the world play a special role. By taking into account land and water use, DESERTEC is intended to offer an integrated solution to food and water shortages in the coming decades. DESERTEC was developed by the Trans-Mediterranean Renewable Energy Cooperation (TREC), a voluntary organization founded in 2003 by the Club of Rome and the National Energy Research Center Jordan, made up of scientists and experts from across Europe, the Middle East and North Africa (EU-MENA). It is from this network that the DESERTEC Foundation later emerged as a non-profit organization tasked with promoting the DESERTEC solution around the world. Founding members of the foundation are the German Association of the Club of Rome, members of the network of scientists TREC as well as committed private supporters and long-time promoters of the DESERTEC idea. In 2009, the DESERTEC Foundation founded the Munich-based industrial initiative 'Dii GmbH' together with partners from the industrial and finance sectors. Its task is to accelerate the implementation of the DESERTEC Concept in the focus region EU-MENA. The scientific studies done by the German Aerospace Center (DLR) between 2004 and 2007 demonstrated that the desert sun could meet rising power demand in the MENA region while also helping to power Europe, reduce carbon emissions across the EU-MENA region and power desalination plants to provide freshwater to the MENA region. Dii GmbH published a further study called Desert Power 2050 in June 2012. It found that the MENA region would be able to meet its needs for power with renewable energy, while exporting its excess power to create an export industry with an annual volume of more than Ã”Ã©Â¼60 billion. Meanwhile, by importing desert power, Europe could save around Ã”Ã©Â¼30/MWh. The goal: "To provide climate protection, energy security and development by generating sustainable power from the sites where renewable sources of energy are at their most abundant." Most of the solar energy would come from Ã”Ã‡Â£concentrated solar powerÃ”Ã‡Ã˜ plants, or CSP plants. The CSP plants use both natural gas and solar panels when generating electricity. Each plant holds a number of parabolic troughs Ã”Ã‡Ã´ several yards tall Ã”Ã‡Ã´ containing receiver tubes above a parabolic mirror and filled with an oil-like heat transfer fluid. The total cost of completing the project is a barrier, too Ã”Ã‡Ã´ itÃ”Ã‡Ã–s currently estimated at over $500 billion USD. A number of recent climate conference attendees focused on the question of how Desertec could be financed; EU subsidies, tariffs added to European energy bills, and bank loans were all the subject of speculation. I wonder why the solar project is conceived on the lake instead on the open desert area. The ability of man! Some people can make any positive and green technology look bad.